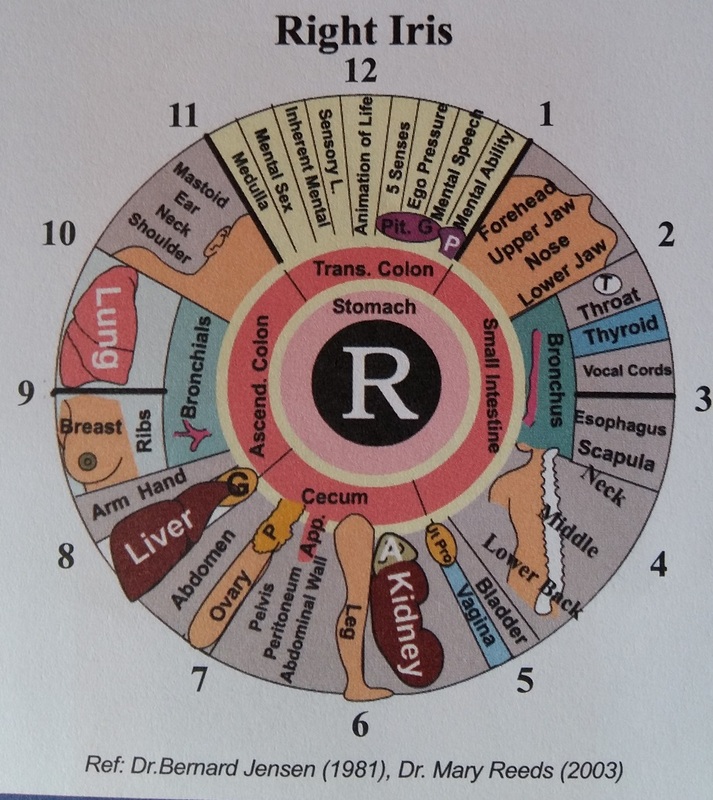 Iridology has long been a diagnosis practice that intrigued me. I had wanted to try it for a long time but did not manage to find a place that can do it (preferably for free, hee hee). 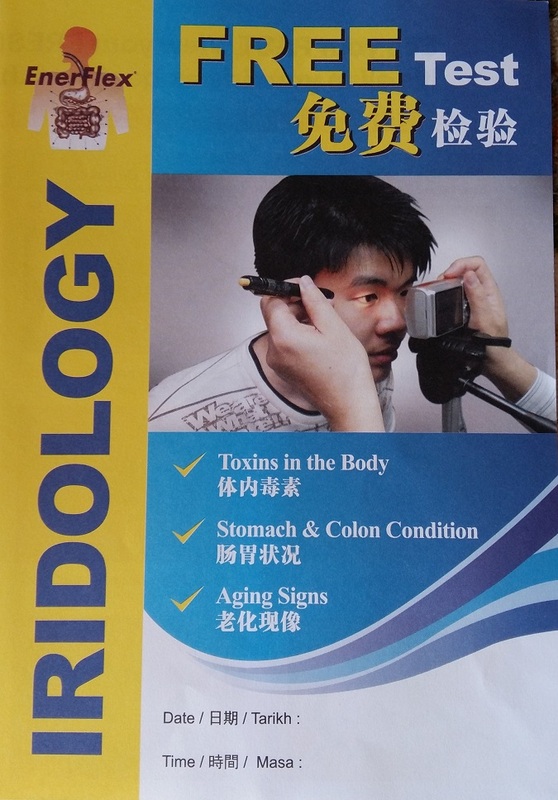 Until recently I chanced upon a free iridology test while visiting a pharmacy. Just through shining a pen light and taking a picture of both my left and right iris, the staff (Mr Teh) was able to diagnose with uncanny accuracy the health problems that I am facing. 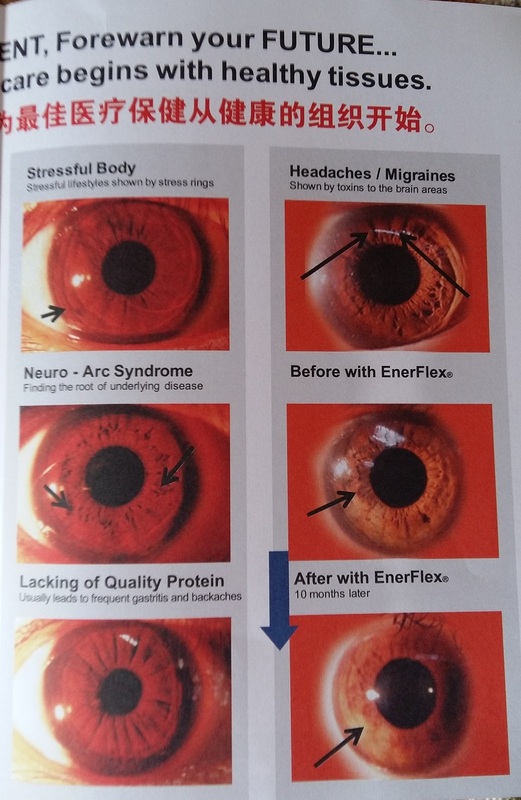 Let me share with you my experience, as well as enclose the pictures from the brochure that was given to me. Basically, the staff did as per the picture above. He used a normal Canon camera (the older version one) with a pen light. He shone the light into my eyes and then take a picture for each of my eyes. 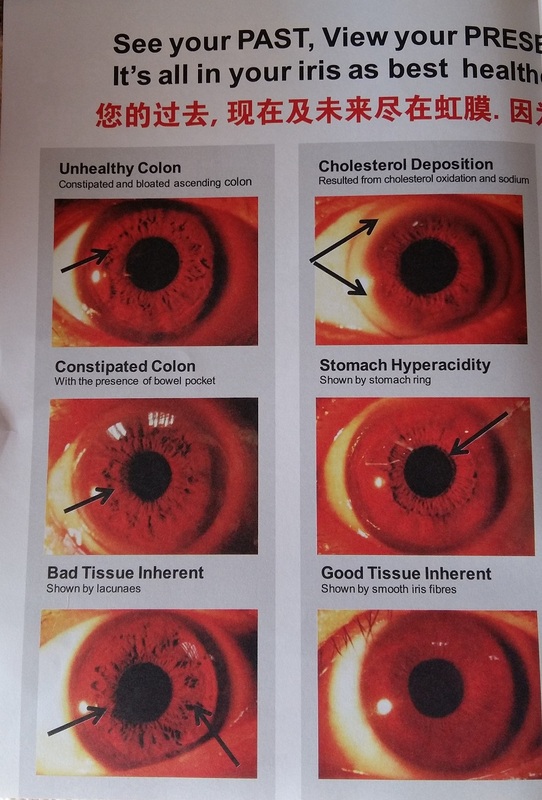 After that, he took this brochure, and explained to me the possible health conditions that I am or would potentially face by showing me the picture of my iris and then using the brochure to explain. I must admit it is quite accurate. Below are some sample pictures of various irises and what medical condition each one denotes. Important: Do not do the diagnosis yourself- please consult a person who is well versed in iridology to arrive at the right diagnosis. 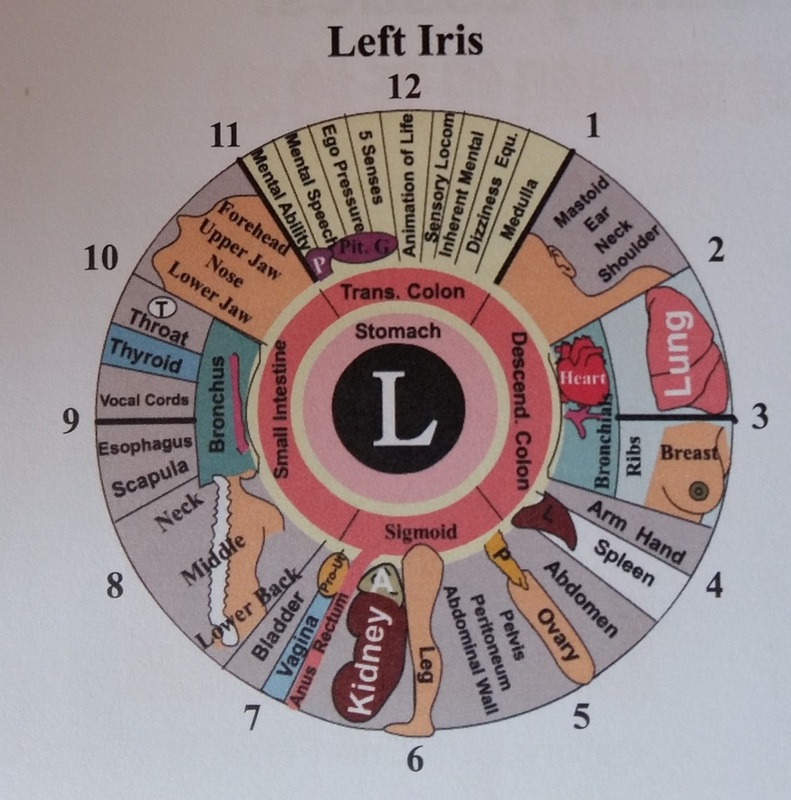 Above: Diagnosis chart in Iridology for the right iris. Right iris: I had some urinary track infection/ inflammation (yes, I do sometimes suffer from this which could be attributed to inadequate fluid intake- when I am too focused on my blog I sometimes forget to drink water). He mentioned sometimes drinking more water may help but if it does not, then I might want to consider taking probiotics. Potential liver issue: He asked if I had family history of either hepatitis or thalasemia. I was surprised he asked that since my mom is currently suffering from hepatitis B and liver cirrhosis. He then showed me a yellow (jaunticed like) coloration located below one of my iris. He said people who had this is showing weakness of the liver or beginning of fatty liver. He mentioned that during early stages of fatty liver, it does not show up in blood tests. Ultrasound would be able to give a more accurate diagnosis. And even if there is fatty liver, there is no medical cure for it hence the person would need to change his/her diet and lifestyle (especially avoiding fried food or food high in fat). He mentioned to me that from the pictures, my heart and kidney functions were normal. I then asked him that sometimes I had pain the kidney areas. He said that usually in kidney failures or issues, there is no pain the kidney area. The pain would likely due to nerve located around the kidneys. Also, there had been times that I felt the left side of my chest is a little constricted. I did visit a GP, in fact twice to check and after placing the stethoscope and listening to my heartbeat, both confirmed there did not seems to be any issue. It was of course a relief to hear him say that from the iridology that I do not seemed to have any blocked arteries. Mr Teh then asked if I do get palpation when I drink coffee and I mentioned yes, I do with certain brands. He told me that I should then stay away from strong doses of coffee. I have also been advised to come for another test about 3 to 4 months later to check again after making lifestyle changes. Overall, it has been an interesting experience. I do not think that the test is able to give the answer to all my ailments but surprisingly it could name a few and possibly highly some potential issues that I should look out for (for example to take good care of my liver). You can sometimes find companies providing free iridology tests as a service to complete health supplements that they are selling. If you are in Malaysia and staying around Klang Valley (Kuala Lumpur and Petaling Jaya), I was informed that this company partner with about 60 to 70 pharmacies monthly to give free iridology tests. I did call up their service number and suggested that they upload the schedule of the location of their free iridology tests so that it can benefit those who wish to visit and have been advised that they are in the midst of revamping the site. They have been in the field of iridology since 2003. I was told that the diagnosis method is very simple- ie shining a light and taking the picture of the iris. But the diagnosis requires experience and skill. Note: This is not a paid review. It is something I came across which I find is beneficial and sincerely wish to share with my readers. When I saw Mr Teh, I was dressed really shabbily and yet he was very friendly and took time to explain about iridology and my diagnosis to me (actually I happened to stop by to buy lunch and as my wantan mee requires 20 minutes wait time, I walked around, went into the pharmacy).